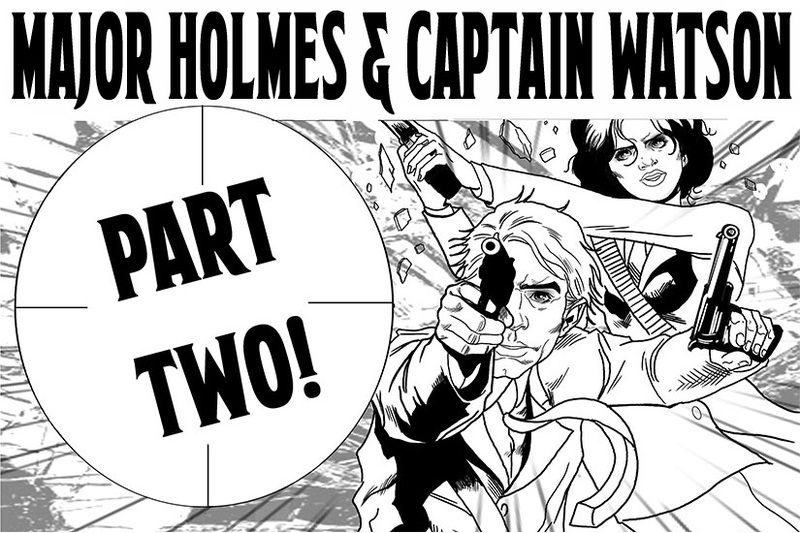 Home » Blog » Uncategorized » Major Holmes & Captain Watson RETURNS!!!! Happy Friday, everyone! Now that the New Year is in full swing, I’m excited to announce the return of Major Holmes and Captain Watson! The second chapter of this exciting web comic series will be available Wednesday, Jan 20th at cloudwranglercomics.com! Maj. Sheffield Holmes, nephew to the Great Detective, and his American partner Capt. Imogen Watson have stumbled upon a dark conspiracy. Someone is killing Serbians in London and implicating The Black Hand! But Sheffield and his compatriots with the 6th Special Intelligence Service suspect a deeper conspiracy at play. Now Sheffield and Imogen must seek out the truth with the help of Detective Inspector Agamemnon J. Brick and their commanding officer: Col. Mycroft Holmes! Written by Jeff Rider (that’s me!) with Art by Carlos Cabaleiro and letters by Rachel Deering, this second chapter will be available to read online or download FREE at cloudwranglercomics.com this Wednesday! Everyone loves new comics on Wednesdays, so don’t miss the chance to catch up on this exciting espionage detective series now! You can also catch up on the first chapter of the series as well, and check out other awesome free webcomics as well, all for FREE! Previous post A New Year, New Comics, and a new way to read them! Next post Been Bit comes to comiXology Submit!